Home European History Where did Father Christmas or Santa Claus originate? Where did Father Christmas or Santa Claus originate? Who is that jolly, portly fellow with the red suit, the long white beard and the sleigh pulled by reindeer? Everyone knows the big guy, who delivers presents to all the children of the world every Christmas Eve, in one form or another. Whether he is Father Christmas, Santa Claus, Kris Kringle or Sinterklaus, this legendary figure is known for bringing delight to many a household every Christmas. The original Santa was Saint Nicholas who came, not from the North Pole, but from what is now known as Turkey. Nicholas was the Greek Orthodox Bishop of Myra in 4th century Byzantine Anatolia. He inherited a vast fortune due to his parents dying when he was quite young, but he joined the church and gave his riches away to those in greater need. St Nicholas was known for various charitable deeds and was even credited with starting the tradition of hanging up stockings to be filled on Christmas night. He died on December 6th, AD 343 in Myra and was buried in his cathedral church. A liquid substance called manna, formed in his grave and is believed to have healing powers. The anniversary of his death is now celebrated as St Nicholas Day. Saint Nicholas’ tomb in Myra became a popular destination for pilgrimages and due to the religious and commercial benefits of this major site, the Italian cities of Venice and Bari strived to get Nicholas’ remains. However, in 1097, pirates raided his tomb, stole his remains and took them to Bari on the SE coast of Italy. A shrine, dedicated to St Nicholas, became one of medieval Europe’s great pilgrimage sites and even today, tourists and pilgrims visit Bari’s great Basilica de San Nicola. The 19th century brought with it, an image of Father Christmas that is more recognized today. The American Episcopalian minister and author, Clement Clarke Moore (1779-1863), wrote a poem “An Account of a Visit from Saint Nicholas” – well known as “Twas the Night Before Christmas”, which featured Santa delivering presents down the chimney accompanied by a team of 8 reindeer, Dasher, Dancer, Prancer, Vixen, Comet, Cupid, Donner and Blitzen. The modern development of “Santa Claus” in America was helped by the introduction of Sinterklaus from the Netherlands, and the German American cartoonist Thomas Nast, who created, for “Harper’s Weekly” in 1863, the first traditional picture of the jolly, fat, bearded fellow in the red suit we recognize today. In this illustration, Santa was handing out gifts to Union soldiers.. It was also Nast who established Santa’s workshop in 1879 with a drawing of a girl putting a letter in the mailbox, addressed to St Claus, at the North Pole. Santa’s wife was created by Katherine Lee Bates in 1899. According to Hennelie de Klerk’s account of Christmas in A Brief Look at the History of Christmas, Santa Claus is known by many different names throughout the world, including: Father Christmas (English), Saint Nikolaas or Sinter Klaas (Dutch), Kris Kringle (German), Befana (Italian), Babushka, a grand-motherly figure (Russian). In Switzerland and Austria the Christkindl or Christ Child (a girl-angel) comes down from heaven bearing gifts. In France Santa Claus is known as Père Noël who travels with Pre Fouettard who reminds him of just how each child has behaved during the past year. In Scandinavia Julenisse, in Denmark Julemanded assisted by elves called Juul Nisse, in Norway Julesvenn, in Sweden Jultomen, a gnome who lives in the barn. In Japan with less than 1% of the population Christian, they have their own gift-bearer, Hoteiosho. 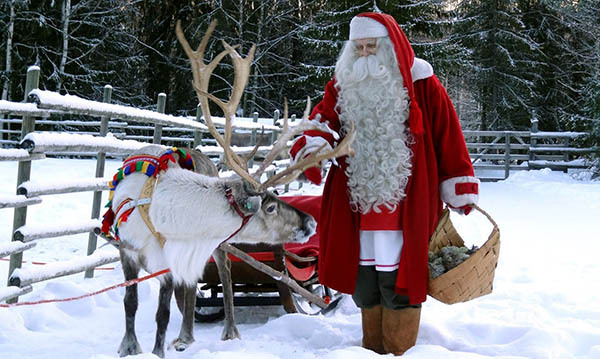 Joulupukki is the name of Father Christmas in Finland which literally means Yule Buck. In Brazil and Peru, Papa Noel and in Costa Rica Colombia and parts of Mexico, el Nino Jesus.